A home win; a brave and determined effort from Robin Devos and Cédric Nuytinck but the end result was to be the second step of the podium when matters concluded in the Men’s Doubles event at 2017 ITTF Challenge Belgium Open in De Haan on the afternoon of Saturday 4th November. The top seeds, they were beaten in the final by Germany’s Patrick Franziska and Ricardo Walther, the second seeds (11-5, 15-17, 11-8, 11-5). Neither pair really into a rhythm, Patrick Franziska and Ricardo Walther won the first game, before Robin Devos and Cédric Nuytinck levelled matters in a second game that ebbed and flowed. At 10-9, the German duo held game point, they held four more, notable electing for “Time Out” when ahead 14-13. The break worked but it was to work in favour of Belgium, Robin Devos and Cédric Nuytinck won the next two points, before on their second game point at 16-15 emerging successful on their second opportunity. One wondered if the close success in front of a home crowd might just be the spark Robin Devos and Cédric Nuytinck needed. It was not to prove the outcome, Patrick Franziska and Ricardo Walther won a close third game before in the fourth establishing a 4-1 lead; the future looking bleak for the host nation duo, they called “Time Out”, it was to prove a cry in vain. Confidence was growing in the German camp, Patrick Franziska and Ricardo Walther surrendered just four more points. Success for Patrick Franziska and Ricardo Walther, their first time as a doubles pair at a major international tournament but not strangers to Men’s Doubles success with more usual partners. 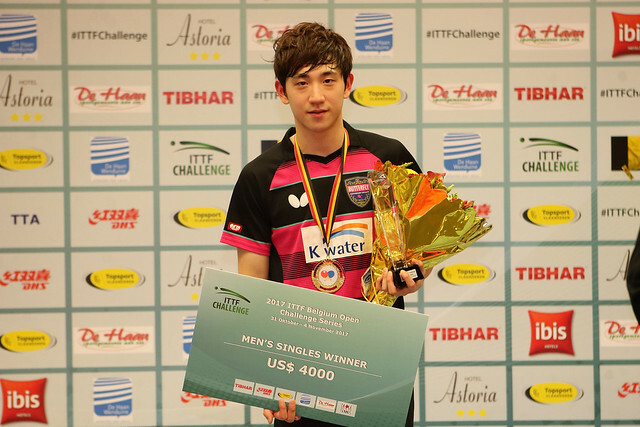 On the ITTF World Tour Patrick Franziska partnered Denmark’s Jonathan Groth to success last year in Austria and earlier this year in the Czech Republic; meanwhile, for Ricardo Walther when partnering Ruwen Filus, also on the ITTF World Tour, runners up spot was gained in 2015 in Belarus and this year in both India and Austria.